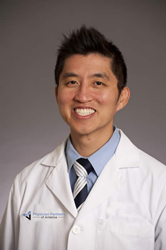 Chau Uong, D.O., has joined Physician Partners of America as a specialist in physical medicine and rehabilitation in its Hurst, Texas, pain management location. PPOA's Hurst practice focuses on interventional pain management, a subspecialty of pain management medicine that concentrates on minimally invasive techniques to treat and manage acute or chronic pain. Treatment may include injections, nerve blocks, and topical and oral medications. These modalities are aimed at getting to the root of the pain and allowing patients to increase their enjoyment of life and ultimately to be pain-free. This drew Dr. Uong (pronounced OO-wong) into the field. A native of New Orleans, Dr. Uong earned his undergraduate degree in Biology and Sociology at the University of Texas – Dallas. He received his medical degree at the Ohio University Heritage College of Osteopathic Medicine in Athens, Ohio in 2012. After completing a preliminary internship in Internal Medicine at Good Samaritan Hospital in Cincinnati, he completed his residency in Physical Medicine and Rehabilitation at Marianjoy Rehabilitation Hospital in Wheaton, Ill. in 2016. He also served as its chief resident and earned a Spirit Award for going above and beyond in patient care. He and his wife have three young children. He enjoys everything martial arts-related, swimming and travel. In addition to English, he is somewhat fluent in Vietnamese. For an appointment with Dr. Uong at the clinic - 1717 Precinct Line Road, Suite 200B, Hurst, TX 76054 - call 817-369-3990. Patient hours are from 9 a.m. to 5 p.m. weekdays with same-day appointments available. Founded in 2013 and headquartered in Tampa, Fla., Physician Partners of America (PPOA) is a national healthcare organization focused on strengthening the doctor-patient relationship and improving patient outcomes. PPOA and its affiliates share a common vision of ensuring the wellbeing of patients and providing their physician partners the opportunity to focus on the practice of medicine. This model allows physicians to be physicians, caring about patients and their needs in the face of increasingly complex administrative requirements. For more information about Physician Partners of America, visit http://www.physicianpartnersofamerica.com.